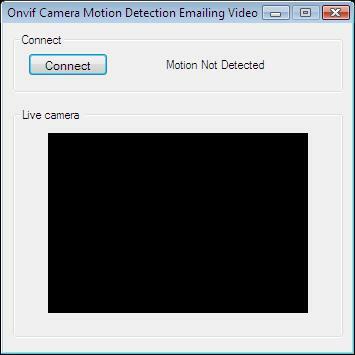 This example demonstrates how to record a video and send it as an e-mail in C# when motion has been detected. To implement this example, you must have OZEKI Camera SDK installed, and a reference to OzekiSDK.dll should be added to your Visual Studio project. How to handle alarms by recording a video and sending it as an email using C#? To establish the connection properly between your application and an IP camera you should apply the same code snippet what you have used in the example (How to connect to an IP camera device using C#?). Important: you should study this article in order to find out how to setup your Windows Forms/WPF Application correctly. It's also recommended to visit the How to setup viewer side motion detection and How to handle alarms by taking a snapshot picture and sending it as e-mail articles before you begin to study and use this functionality. With this method we are able to react for the events of the motion detector object (whenever the IP camera detects motion we are realizing the event). This method will be called within the previous method and is going to capture the video because of the detected motion. With this method we are able to subscribe to the events of the multiplexing process and when it's over we are going to call the sendEmail() method. This method is going to stop the video capturing process. Finally, the captured video must be sent to the requested email address. Notice, that in the motionDetector_MotionDetection() method you can modify the time period how long the camera should capture the actual video. The default value is 10000 (given in milliseconds). It's possible that the scanning process will take some extra time so the next detected scene won't be captured instantly. After the successful implementation of the functions and the GUI elements, the application will work properly. Pressing the connect button will load in the image of the IP camera device connected to your PC into the panel that you can see on the picture. When the motion detector detects motion, the motion label text will be changed. You should add the System.Drawing.dll and the OzekiSDK.dll to the references of the solution. I sent a video but I didn't get the email at once. Why? The mail server is overloaded permanently. The uploading speed is low.